With one-hour elapsed time feature and sweep hand. The start, stop and fly back of second and minute hands does not disturb time of day. The lever for adjusting rate is accessible without removing the clock movement from its case. Clocks contain an unbreakable, anti-magnetic cobalt alloy mainspring and an anti-magnetic temperature compensated hairspring to ensure accuracy. 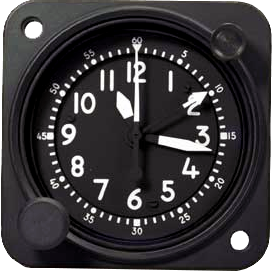 Mechanical clocks are stand-alone, time keeping instruments which are not affected by environmental extremes or system failure. Spare or replacement parts available.